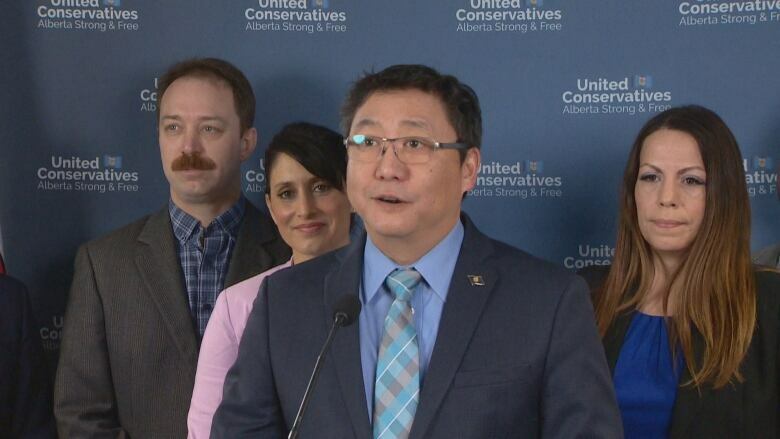 A United Conservative Party government would back a new scholarship and support fund for first responders, armed forces members and their families, UCP MLA and former paramedic Tany Yao announced on Saturday. Yao said the two initiatives would honour first responders, who "exemplify" the meaning of public service. "There's no higher form of public service than to risk one's life in the defence of our country and in maintaining public safety," Yao said in a news conference. "Those who do so are heroes, and deserve the respect and support of their fellow Albertans." The Alex Decoteau Veteran's Scholarship would offer $5,000 to members of the Canadian Armed Forces in reintegrating them into the labour market after their service. It would also be available to family members of service members who have died. Decoteau joined the Edmonton Police Service in 1909 as Canada's first Indigenous police officer. He was killed by a sniper in 1917 in France while serving with the Canadian Army in the First World War. The second initiative is the Heroes Fund grant, which would provide a one-time, tax-free payment of $100,000 to families of first responders who have died in the line of duty or from suicide. This would be given in addition to the federal government's Memorial Grant Program, which offers $300,000 to families. The total annual estimated cost of both programs is $4 million. The Heroes Fund grant would be given in recognition of service and sacrifice. Nine families would be eligible each year, Yao said. Families should not face financial hardship in the event their loved one is wounded or killed in line of duty, Yao added. "When a member of the armed forces or first responder is killed in the line of duty, it is a devastating loss to their family and the community," Yao said. "Our province has a duty to support their families."